It has been a while since we see Priyanka Chopra in Bollywood movies. Well, it is because she was working on her Hollywood project. She was busy in the shooting of the third season of ABC’s Quantico. Recently it was revealed that she will be starr opposite to Salman Khan in the upcoming movie Bharat. Salman Khan took to Twitter and pulled Priyanka Chopra’s leg as she is making her Bollywood return after working in Hollywood. 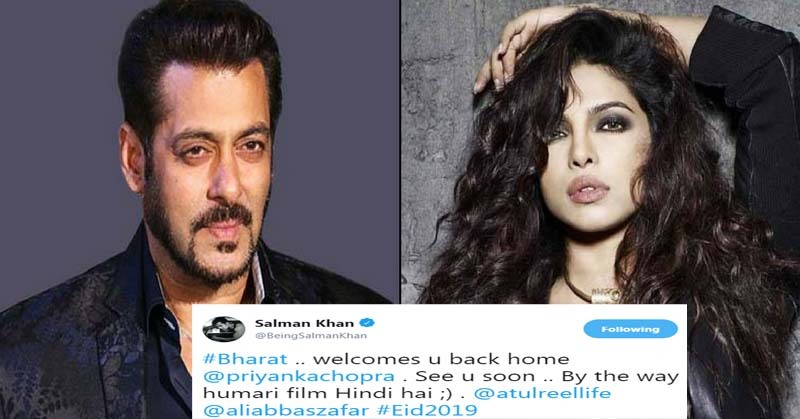 He wrote, “#Bharat .. welcomes u back home @priyankachopra. See u soon. By the way humari film Hindi hai;). @atulreellife @aliabbaszafar #Eid2019”. First Collaboration Of Ali, Salman And Priyanka Together. Ali Abbas Zafar has collaborated with Salman Khan in Tiger Zinda Hai and Sultan. Priyanka has also worked with Ali in Gunday (2014) and shares a good rapport with him. This film will see the three of them collaborate for the first time, Moreover; another source says that Ali met Priyanka in New York where she was shooting for Quantico. On top of that, the upcoming collaboration is officially confirmed now. The movie is the official remake of the South Korean movie, “An Ode To My Father”. Salman Khan will play the lead role which will be featured from his teens to his eighties. What do you think about this movie? Are you excited for this one? Share your thoughts in the comments. Also, check Priyanka Chopra talked about her dreams and her Bollywood return.